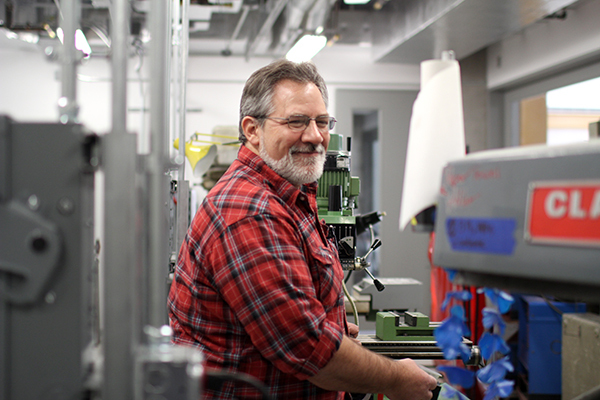 Bill Rutkowski, a machinist in the department of mechanical and aerospace engineering, uses GW's tuition benefits to help pay his son's college tuition. The University trimmed tuition benefits earlier this fall, and some say that could make hiring high-quality employees a challenge in the future. Bill Rutkowski, a machinist in the department of mechanical and aerospace engineering, said he was drawn to GW nearly 20 years ago because of the chance to finish his master’s degree while working full-time. Once his wife had a son, Rutkowski said his focus shifted from his own degree. Now, his son is a freshman at Marymount University and GW covers nearly 90 percent of his tuition through a tuition exchange. “It’s definitely worked out for me. It takes a lot of pressure off. You think, ‘OK, maybe I’ll retire some day instead of working off a student loan,’” Rutkowski said. But Rutkowski said recent changes to GW’s benefits may make potential employees weigh other options. That warning has been echoed across campus for the past several months. It again picked up steam when Charles Garris, the chair of the Faculty Senate’s executive committee, cautioned the Board of Trustees that GW could struggle to attract talented staff after scaling back tuition benefits this fall. He said the University could also lose current staffers who came because of the tuition benefits that let them get a degree while working full-time. He said the scaled-back tuition benefits could deter potential employees who have to balance a high cost of living: The Bureau of Labor Statistics named D.C. the most expensive city to live in earlier this fall. The University announced in September that it would cover 90 percent of the cost for 18 credits for faculty and staff earning a degree – down from 96 percent of the cost for 21 credits in the past. Employees had paid just 4 percent of their tuition if enrolled in a degree program, and only had to work at GW for three months to receive the perk – half the amount of time that’s required now. If employees leave, officials have made it more difficult to close those gaps by implementing a policy to delay new staff hiring by a minimum of six months going into the next fiscal year. The changes will cost staff members $1,126 more for 18 credits a year, and $4,130 for 21 credits, according to an analysis completed two weeks ago by the Staff Association, a group that launched this year to advocate for more staff involvement in decision-making across the University. Robin Kuprewicz, a department assistant in the School of Business and the communications chair of the Staff Association, said the cutback forced lifestyle changes on her and other staff members. Kuprewicz, who is studying anthropology, said she had to re-evaluate travel plans around the holidays to make sure she’d have enough to cover her increased tuition this spring. She’s started looking into student loan options in case she’ll need to take some out in the future. This fall, more than 800 University employees signed a petition asking officials to keep the original benefits in place. GW offers faculty and staff competitive benefits, including health care, free exercise classes and paid time off, said Sabrina Ellis, GW’s vice president for human resources. “Every year, when reviewing benefits we work closely with our benefits consultants to conduct an analysis of our university market peers and other organizations in the Washington, D.C. area,” Ellis said in an email. The decrease in tuition benefits will save GW $750,000 this year, and that amount will be funneled into employee health insurance, Ellis said. About 660 employees signed up for the tuition benefits last year, and about 50 staff members took more than 18 credits in 2013. University President Steven Knapp also charged a group of faculty and staff members in December to spend a year creating a long-term plan to divide funds for tuition benefits, retirement and health insurance. At Friday’s Faculty Senate meeting, Garris said the executive committee had been told that the creation of the task force would involve the administration’s response to a Senate resolution asking to grandfather in current student-faculty to keep their previous benefits rates. Chris Leinberger, a nonresident senior fellow at the Brookings Institute and research professor of urban real estate, said universities typically have larger benefits packages than other institutions, which make up for offering smaller salaries. An employee’s preference for benefits are typically determined by his or her stage of life, he said.